Transportation Costs > How Much Does a Bobcat Tractor Cost? How Much Does a Bobcat Tractor Cost? For more than 50 years, the Bobcat Company has been the industry leader, building compact equipment to help individuals and companies work more efficiently. These tractors are known to be tough, comfortable, versatile and high in performance. The cost of a Bobcat tractor will depend on the type, how you configure it, the dealer you purchase it from and where you live. Just like purchasing a car, it can be hard to offer an exact quote since so many variables come into play. The company doesn’t publish its prices, but according to our third-party research, the biggest factor in pricing will be the load capacity. Generally, the higher the load capacity, the more it’s going to cost. A smaller skid steer machine, which is capable of operating around 1,400 pounds or less, can cost about $20,000, whereas a 1,600-pound capacity skid steer can cost about $5,000 more. For a larger 2,000-pound machine, the cost can be in the $30,000 range, while a 3,000-pound capacity tractor can cost close to $50,000. The company offers six categories: skid steers, a compact truck loader, mini track loader, compact excavator, utility work machine and a utility vehicle. To date, the company has more than a dozen skid steer models, for instance, including the S-Series and the M-Series, and these skid steers, regardless of the series you purchase, has been designed to fit in tight spaces and deal with virtually any terrain. The rating operating capacity, on most of the Bobcat tractors, will range from 700 to 4,000 pounds, whereas the operating weight can range from 2,500 to 10,000 pounds. Optional features, which can increase the quote, can include a cab enclosure with sound and heating, a sound reduction option, suspension seat and/or an upgraded tire package. 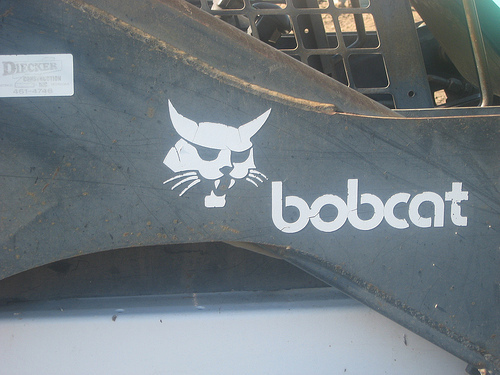 Close to 100 attachments are available on the market for any Bobcat-branded tractor, ranging from a backhoe to a bucket, blades, concrete mixers or augers. Most attachments should be in the $800 to $2,100 range, depending on the exact type you’re looking at. Used, yet durable tractors with less than 3,000 hours logged, can be purchased at a reasonably low price. On average, you could save about 25 to 50% off the entire price if you were to purchase used. If you only plan on using the tractor occasionally, you can opt to rent one rather than buy a new one. Renting makes you control expenses and will eliminate the hassles of tractor maintenance. Apart from saving money, renting allows you to save time and gain peace of mind by eliminating licensing costs, paperwork, and insurance changes. Like a car, it can be hard to spend tens of thousands of dollars in cash. With that being said, most reputable dealers can connect you with financing departments, or if you wish to work on your own, you may be able to find a bank that can fund your loan. For example, at the time of this writing, we were able to find some dealers offering zero percent financing.